This is a game which will divide opinion. Whether you enjoy this game will depend on whether you are happy to play simplistic and repetitive games which have that annoying one more go factor or whether you seek some depth from your games. If you are looking for a game with lots of options and variation in game play then this game will not be for you. If you enjoy simplistic game ideas, which have that immediate pick up and play quality then read on. The idea of the game is simple but hard to master. You have to guide your character from the bottom right corner of the screen to the top left corner whilst avoiding lifts which cut across the corridors. 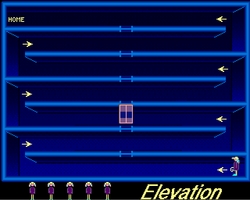 As the levels progress, there are more lifts moving across the screen and at later levels the lifts move at different speeds to add to the difficulty. The presentation of the game will also divide opinion. Some may argue the graphics are basic and the animation of the main character crude. Personally, I think the graphics are functional and serve their function to depict the corridors. The animation of the main character may not be the smoothest but it does have a certain charm and does manage to create some emotional attachment as you do care about the little chap whenever he unfortunately meets his end. The sound effects are the best part of the game in terms of creating the atmosphere. The music is a strange choice, containing dog barks and other animal noises but seems to work. There is a quirky "Marvellous" speech sample when you reach your goal. Overall, this game is fun for short bursts. To succeed at this game requires nothing more than good timing. However whilst this should be easy it is a skill which proves difficult to master. This game is availabe on the Amiga CF disk download. This game is a shareware demo which contained a smaller version of the finished game. If anyone has the full version or has the contact details for the programmer of this game then please contact AmigaPd as we would love to have the opportunity to play the full version of this game. As you can probably guess from the opening paragraph this is a game we enjoyed playing. Similar to Elevation the game has a simple idea at the heart of its game play. You control an Electrician character who has to alter the electric current by activating different switches which are located across the screen. The game has a novel use of the game area. 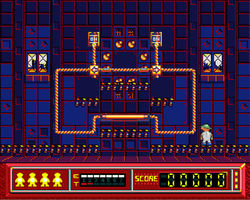 Although the game could be discribed as a 2D platformer the game operates across two planes. You can move your character around the front plane or move him to the back of the screen. Your player will jump between these two areas whenever you press fire and either move forwards or backwards. This control method will prove difficult to master at first but it is worth perserving with as once mastered the game becomes very addictive. The presentation of this game is very polished, however this was to be expected with a shareware title as in order to generate interest in the full version the games had to rival the budget titles available at the time. This game certainly succeeded in this area and clearly stands shoulders above Elevation in the presentation stacks. Overall this game is worth spending time on to master the controls as the player is rewarded with a fun game. The problem is with the majority of PD games having instant pick up and play game controls there is a threat this game maybe overlooked for games with a less challenging control mechanism which would be a shame. Van Merak IV, 3070 AD, A United Planets research base on the planet was destroyed by the evil Stingon Empire using planetary bombardment. However, not all of the base was destroyed - one outer post remains, and with it its surving personnel. What do the Stingons want with a peaceful research base? What is the sinister truth behind the Experiment? One man would not give up hope. He would fight to the end. His name was Bud Lighting, and this is his story ... So begins the story behind the GRAC demo version of the Experiment. For those of you who have not heard of GRAC before, I will quickly update you. GRAC stands for Graphic Adventure Creator and was a licenceware program created by Edmund Clay and enabled users to create their own graphic adventures similar to those popular on the Amiga at the time such as Monkey Island. The Experiment was created by Edmund's younger brother John Clay created the Experiment with his friends Ant Dzeryn and Mark. 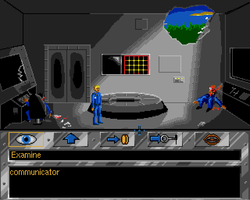 The game is the stand point and click adventure that requires you to select a graphic icon to perform actions. The actions available are; Talk to,take, Operate, Use and Talk to. You select the actions with the left mouse button and use the right mouse button to execute. The first problem you have to solve is how to escape the room which has been hit by the bombardment. This shouldn't take to long to solve as there is only a rock which can be picked up in this room and very few items to use it on. Once you escape the room, the adventure begins. You will progress through the game in the usual manner by talking to non playing characters, picking up items and using those items to solve puzzles. The attraction of these games lay in their presentation, interface and story. The GRAC system provides an easy system to use and keeps the actions simple without presenting lots of actions which are only used occassionally. The graphics, whilst not of the standard of Lucas Arts games are still very professional and succeed in creating a believable world which the player wants to explore. 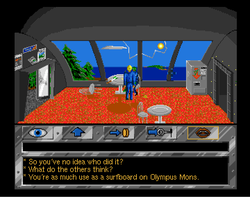 There is a gentle humour in some of the verbal exchanges, similar to the put downs in Monkey Island your character is able to use a humourous put down to the characters he meets and has no qualms with telling the second person alive after the explosion that they are "as much use as a surfboard on Olympus Mons". In conclusion, if you love point and click games then you will enjoy this. If you don't like point and click games then you will probably not enjoy the game as the genre can be slow, requires the user to read the verbal exchanges and the problems do involve some thought rather than relying on shooting everything that moves. If you are a big fan of Point of Click adventures then you will probably enjoy visiting Burns Flipper Games Emporium website which contains lots of graphic adventure games to download and play aswell as a good interview with Edmund Clay the creator of GRAC. Video taken from Youtube - Uploaded by S2325.